Aaren D’Silva and Veegan Ferrao scored for the Junior Gaurs, while Bonny Niasso and Kouame Joseph equalised for the Beachside club. Calangute Association came from the two goals down to hold FC Goa to a 2-2 draw in the Goa Professional League match played at Duler Stadium earlier today. Calangute got back to the fourth position with 18 points from 12 matches, while Goans remained at third position with the same number of points. Goans had back-to-back victories against Dempo SC and FC Bardez in their last two matches, while Calangute were also in the similar form as they had straight three victories against Santa Cruz Club of Cavelossim, Corps of Signals and Panjim Footballers in the last three matches. 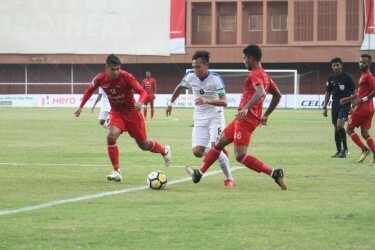 Goans started without Listo Colaco, Yasir Mohammad and Leander D’cunha as Veegan Ferrao, Rinjoy Fernandes and Krishna Pandit replaced them, while Jason Barbosa was also back in the Gaurs’ lineup. On the other hand, Calangute also had few changes to their side as U-20 Goalkeeper Selwyn D’Souza replaced injured Jason D’Mello, whereas Amar Halankar was also back in starting XI for the Beachsides. Goans had a dream start to the league as after two quick shots from Hayden Fernandes and Veegan which were excellently saved by Calangute keeper Selwyn, Aaren D’silva opened the account for his side in the 3rd minute when he smartly tapped over the out of position keeper Selwyn to make it 1-0 for Goans. Ten minutes later, Goans once again broke Calangute’s last line when Krishna made a darting run on the wing and curled it to Veegan in the box who made no mistake to head the ball home from close to make it 2-0 for the Junior Gaurs. 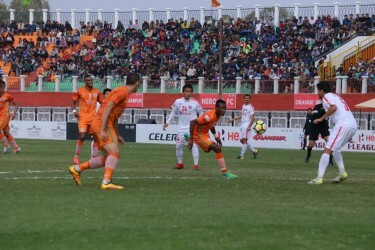 Aizawl hold NEROCA to goalless draw as Manipur outfit lose ground in title race was looking like the match will witness more goals from the Goans, Bonny Niasso reduced the margin for Calangute in the 22nd minutes when he dribbled past a defender in the box and finished the ball in the back of the net, after receiving a long ball from Amar. Eight minutes later, Calangute got the best chance to put the terms on the level when Goan defender Jason brought down Leslee Britto just outside the box to give away free-kick in the dangerous area, where Calangute Nigerian defender Kouame Joseph nicely curled the ball in the net from the 20 yards free-kick to make it all square for his side. The later part of the session witnessed both the defence line cancelling rivals as both the teams entered the half-time with two goals each on their side. On crossing over, both teams tried hard to break the deadlock but either side’s defence made no mistake to clear every danger. However, in the 54th minutes, Calangute had a chance when Omkar More made a low cross in the box where Goan defender Lalnunsiama failed to clear the danger but their keeper Mohammad Nawaz quickly got over it before Calangute’s Joston Pereira could do any damage. A few minutes later, Calangute keeper Selwyn came with two brilliant saves as he first made a diving effort to clear Hayden Fernandes’ 35yard free-kick, whereas he once again dived to his left to clear Meldon D’Silva’s header of resulting corner. Goans almost found the equaliser in the added time when Aaren shot was entering the goal after hitting keeper Selwyn from close but their defender Bresal Viegas cleared off the goal line to earn at least a point from the match.